Aloo aur Pyaz ke parathe, delicious and sumptuous! These whole wheat paratha stuffed with a filling of spiced mashed potato and sauteed onion worked wonderfully. The raucous festival of colours HOLI is here, a celebration of vibrant spring, fertility and the triumph of good over evil. Wishing you all a very happy and safe Holi! 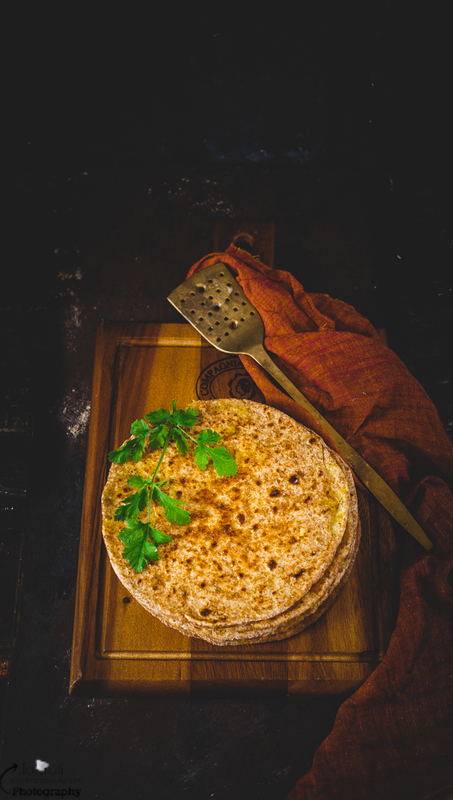 Stuffed Parathas filled with potatoes are hugely popular in most of the Indian household, but for my dad, it was an exciting treat, especially on his birthday. He wouldn't ask for any special treat but only would request to have these humble aloo aur pyaz ke parathe! Today, is his birthday, if he was still with us today, this Aloo aur Pyaz ke Parathe would be at the top of his list. So today's recipe is dedicated to my dad! In my parent's house and here in mine, we hardly eat potatoes so these Aloo ke Parathe always considered as a treat. This recipe belongs to my Dad, his recipe is with little variation. 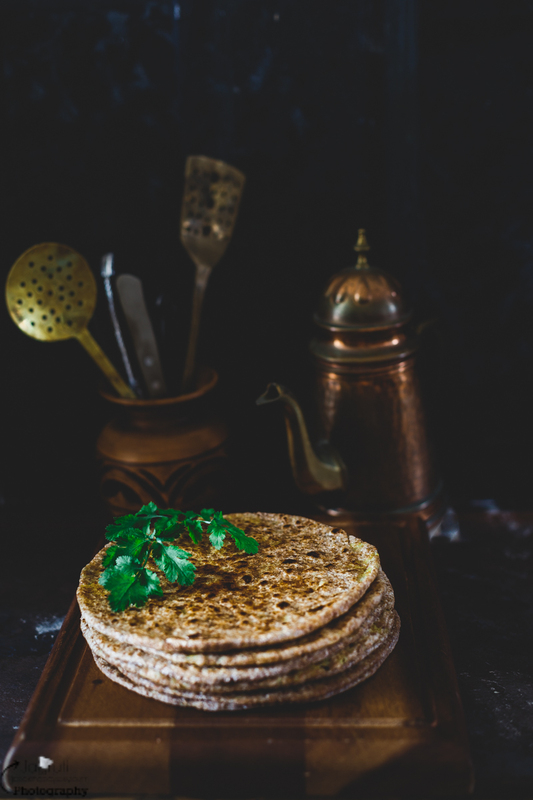 These stuffed parathas can be served alongside with curry, sabji or can be eaten with various kind of dips, chutneys, and yogurt. 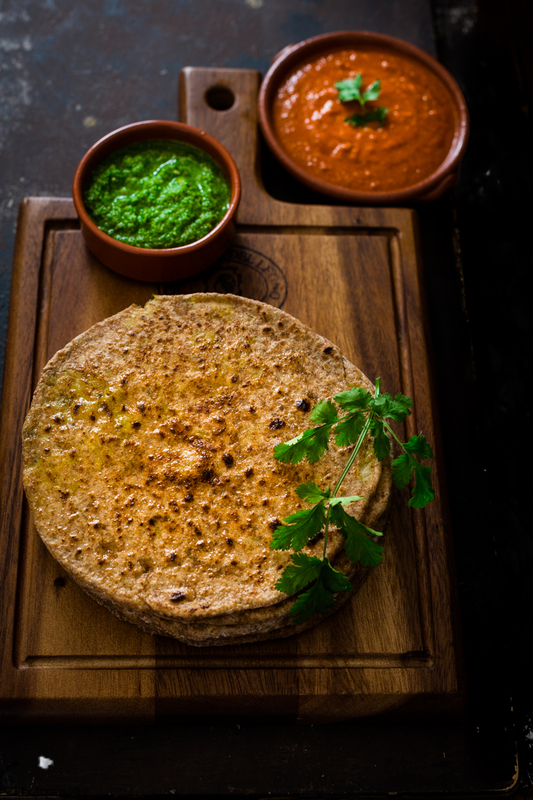 To get perfect Aloo paratha, there are a couple of things you need to keep in mind. See notes below. In a wide plate ( Parat ) combine flour, salt and ajwain. Add enough water and knead the softer pliable dough. Rub oil, cover and leave it to rest for 15-20 minutes. Heat oil in a non-stick pan, add cumin seeds, once it crackles add hing. Add onion and saute till transparent, add minced ginger and chillies. Cook for few seconds then add turmeric powder. Quickly mix everything and add mashed potato and salt. Stir well and cook for only a couple of minutes. Switch off the heat, add freshly ground black pepper, lemon juice and mix once again. Take it out on a plate and let it cool completely. Now add coriander, mix again and divide the stuffing into equal portions and keep it aside. Once you are ready to make paratha, divide the dough into equal portions and make balls. Roll thin out one ball on a floured surface about 4-5" diameter. Place a one stuffing bowl on a rolled dough. Gather the sides and bring them together, once again make a ball. Press gently the stuffed dough ball and roll once again on a floured surface. Heat griddle or frying pan and cook both sides applying little oil till light golden. Serve hot with any curry, chutney, dips, raita, lassi or tea. This time I served mine with Raw Mango, Red Chilli and garlic Dip and Green Chutney. Always make Aloo Paratha with floury potatoes like King Edward and Maris Piper. Let the stuffing completely cool. Keep dough little softer side as stiff dough get cracks while rolling. Roll paratha without any pressure, so the filling doesn't ooze out. I am really like your blog, it's not for only recipe, its for all the way instruct and present and the food photography. Very good post and blog, Nice recipe. up hee "Aloo aur Pyaz Ke Parathe - Stuffed Pan fried Indian Flatbread with Potato and Onion". online sites, I'd like to fkllow everything new you have to post. your Facеbook page, twitter feed, oor linkedin profile?